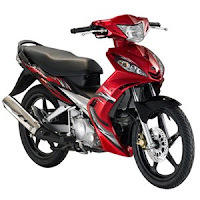 Yamaha MX Modif once again create a surprise with a swift swing of 4 models' kapcai 'once again enliven the world motorcycle negara.Saya forget last peluncarannya real effect but this model is very welcome that scene as the previous model Yamaha 125Z and Yamaha TZM 150. I take only a summary of the name in writing that is' LC 'intention to bring the' Cool Liquid. 'As we know which model or LC135 Yamaha' LC 'is filled with the latest technology that allow us to drive more smoothly without feeling concerned with performance . Let one of the technology that rendered the race to the 'LC' This is on the blog this cylinder motor components contain a mixture of materials' DiAsil. 'This material is a mixture of aluminum out with Silicon aloi then be incused the surface of the cylinder walls, strong and fast mengoyah heat.